My family is a Legumes lover, I try to use them weekly in my cooking just like my mom and my Grandmother used to do when I was a kid. Legumes are so good for your body, full of vitamins and protein. 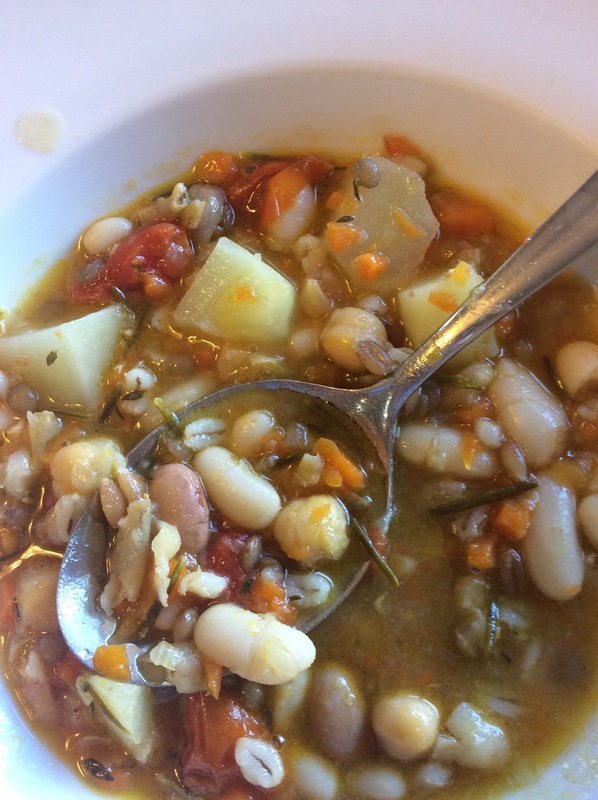 Today I want to share with you this healthy Soup recipe that in Italy its called “zuppa del contadino”/ Farmer soup. I feel healthy already, please challenge yourself and make it for you and your family and let me know how goes, please. Homemade food is the best and this soup will nourish your soul. First thing to do is to soak your dry legumes in water over night or if you are making it for dinner you can do it early morning like I did. In a pan put the oil and add the celery, carrot and onion chopped finely (this is the soffritto) and stir fry for a minute or 2 and add the legumes drained and rinsed! Mix everything and add the vegetables broth. Add the tomatoes diced, the herbs, and the Parmigiano Crust if you have it ( if you don’t have it’s ok). Cook everything for half an hour on a slow heat with lid adding a little bit of salt! Add the potatoes that you previously cut in dice and cook for 30 more minutes! Check the salt at the end and add a little bit of oil before to serve it. Delicious, healthy homemade food is the best! TIP: to make a vegetables broth just boil a carrot, onion, celery and salt for 30 minutes.